After a ten day trip to several European countries, His Holiness the Dalai Lama opened a four day teaching session, with a speech to over 5000 devotees, including nearly 900 Taiwanese. After successfully concluding about a 10-day trip to four European nations, the spiritual leader of Tibet His Holiness the Dalai Lama on Monday, September 30 commenced a four-day teaching on Nagarjuna's "Sixty Stanzas of Reasoning and Tsongkhapa's "Concise Treatises on the Stages of the Path to Enlightenment, at the main temple in Dharamshala, India. Addressing over 5,000 devotees, including 900 Taiwanese, 50 devotees from mainland China and Hong Kong and international visitors from over 50 countries, His Holiness praised the devotees from Taiwan and China in their recitation of Heart Sutra in Chinese, urged them to study and research on Buddhist teachings. The Tibetan spiritual said the "wisdom" taught by the Buddha thousand years ago can be developed to solve "many problems we face in the world today." The four-day teaching sessions are held at the request of followers and devotees from Taiwan. The teaching began with a recitation of the Chinese version of the Heart Sutra by the devotees from Taiwan. "I had opportunity to listen Chinese monks reciting the Heart Sutra in Chinese during a visit to Singapore and Malaysia in 1960s and we recited it together," His Holiness told Taiwanese devotees, while sharing a short story of a Chinese monk. "There were many Chinese who recite the Heart Sutra in the past, it has declined lately," he stressed, adding there are now about 400 millions Buddhists in China. "As you just have recited the Sutra, His Holiness explained, its ultimately aims to "remove the three poisons—ignorance, attachment and aversion, or hatred." The "three poisons"- which of attachment and hatred – are destructive emotions. His Holiness said "it is not only a matter of religious teachings." "If we make careful and thorough investigation, these delusions are the cause of so many problems in the world today." He said these "are realistic problems" to solve. His Holiness said that the "ignorance or lack of understanding is the very root distortion from which hatred and attachment stem". His Holiness asked the devotees from Taiwan, "How many of you do not receive my teaching before? Most of the people in the group raised their hands. "Ultimate goal is 'Happiness,' His Holiness said everyone "wants to be happy and do not want sufferings. Therefore, in order to remove the ignorance, it must do through a long term "wisdom practice." His Holiness going through the teaching text, "Buddha himself said that "Buddha neither wash-away the sins of the sentient-beings, nor remove the beings' sufferings, nor transfer the realisations in his own continuum and give them to others." Overcoming the ignorance and suffering, His Holiness said "we can not do so, merely by developing sense of wishing to be out the sufferings and Samsara. One must has practice of the developing wisdom and realise the very nature of reality." On the other hand, he said we have "this intelligence and wonderful human brain", which other animals do not have. Because of the intelligence we have, we developed language and scripts. "Through this means, we have the ability to think long-term, then come out many different things, including all kinds of writing and so on. 'All these different things we do, of-course our ultimate goal in our life is "happiness", His Holiness said. In order to have happiness, we develop faiths, then it also creates 'fears of darkness, eventually people also put their hope in order to overcome fear of coldness, then start worshiping fire and so forth. This is much philosophical idea and background to them such, he said, adding there are "two developments of love and compassion". The philosophical differences among the religions, there is something which is necessary, he said. Because there are people for whom more effective, if the idea of create a God and seeing the God has been infinite love- then critical. The Tibetan spiritual leader went into further in the philosophical teachings, he told there is no external phenomena, everything is the nature of mind, which is the teachings of the Mind-only School. The Madhyamaka teachings, Buddha has said there is nothing which exist inherently. "In this way, the religion which is meant for peace of mind, but if its used for some negative purpose," His Holiness said "it is very sad,- creates divisions and negative emotions among the religions." Therefore, he said "when it comes to faith, you have to keep faith in your own religion, but should respect all other religious traditions." "In the recent years, scientists who began to show interest about consciousness or mind." His Holiness said "scientists say that a healthy mind is a major factor for a healthy body". The spiritual leader said that some scientists have also seen that because of the ups and downs in our emotions, they are aware of if these emotions create the problems, through their deeper research into the brain activities. 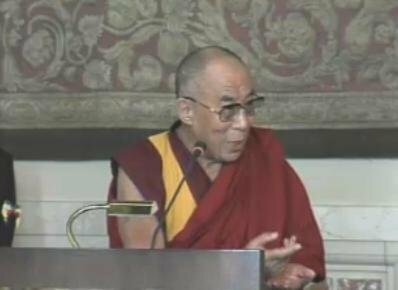 Wherever His Holiness goes throughout the world, he talks about the values of fundamental universe: compassion, tolerance, forgiveness—referring to three main goals in life to which he is particularly committed;- developing human values, promoting inter-religious harmony and the well-being of the Tibetan people.